Rated: PG for Muppet related humor. Gonzo. When I was a kid, my hero was Gonzo the Great. I was weird, and a bit crazy, and identified with the big, blue-nosed lunatic that always dreamed of become a great daredevil, though always failing. How could you not love such a dreamer? Heck, how can anyone not love the Muppets? The fantastic puppet creations by Jim Henson started with their SNL-like sketch show in the early 1970s, going on the inspire countless movies (three considered canon, the rest with their moments of comic genius but most forgettable). Since Mr. Henson’s death in 1990, many thought the Muppets have become the great comics of a past generation, relics of a forgotten era. But one only needs to pull up Youtube videos of Fozzie’s stand-up, Animal’s drumming, or Honeydew’s lab for proof that their comedy is timeless. In an age where our comedy has become much more cynical, could the Muppets find a place? That’s the hope of the latest film, simply titled The Muppets. The film is the brainchild of Forgetting Sarah Marshall duo Jason Segel and Nicholas Stoller, who you may remember ended that film with a puppet musical of Dracula. 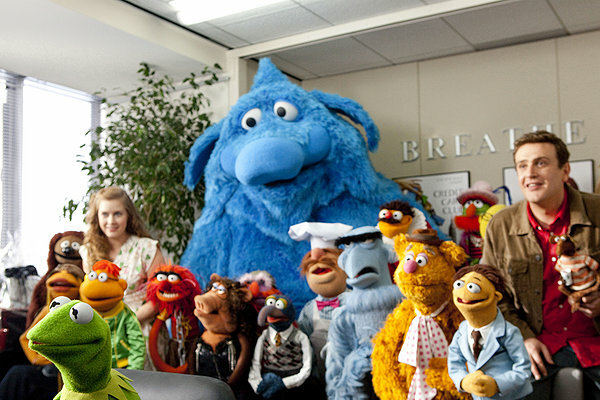 It’s obvious from the first moments of their latest film that Mr. Segel (who stars along with the delightful Amy Adams) and Mr. Stoller are Muppet devotees, and their great nostalgia shows along every frame of this film. In fact, few films are more nostalgia whoring than The Muppets, which means fans of those guys will go bonkers for this latest iteration, which I sure as hell did. The paper-thin story starts out by introducing us to the latest Muppet, who is actually not a Muppet, but simply a puppet in the real world. 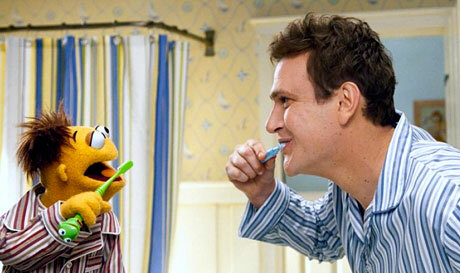 Walter is a short and thin human shaped puppet who lives in twin beds with his brother Gary, played by Mr. Segel (if they have one human and one puppet parent is never exactly explained, nor should it be). After a delightful song-and-dance number, Gary takes his girlfriend Mary (Ms. Adams) for their ten-year anniversary and Walter comes along to finally see his life long dream: the Muppet studio. But the music and stopped and the lights shutdown, there will be no Muppet show tonight. 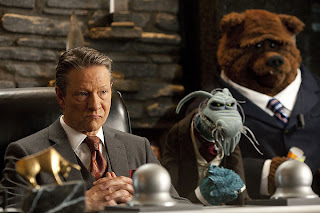 The studio is dilapidated and an oil baron, played deliciously evil by Chris Cooper, plans to buy the Muppet studio and drill right on top of it. From there, it becomes a “let’s get the gang back together again” story as Walter, Gary, and Mary track down everyone’s favorite frog, Kermit, as they decide to do one last show to raise the ten million dollars needed to save the studio. Often, The Muppets is less of its own product than an homage to the classic days of the Muppets. Many of its best jokes are recreations from the classic show or the original Muppet movies. But damn if those Muppets aren’t absolutely hilarious, and many of the throwaway side plots, such as Animal being stuck in an anger management program that has taught him drumming is bad, work like gangbusters (along with the plentiful cameos that populate the film). Mr. Segel and Mr. Adams are totally wonderful in the world of the Muppets with their Disney-like antics and flat characterizations (He doesn’t want to grow up; she wants to get married) seem like less of a fault than a necessary addition to the story. The real MVP of the film perhaps may not be on screen, but instead Bret McKenzie, the singer-songwriter from Flight of the Conchords who wrote the numerous songs that I’m still singing days after seeing the film (the film’s director, James Bobin, worked on a number of episodes for the Conchords HBO series). While The Muppets probably won’t become a classic for the ages, its an excellent reminder of what made Kermit, Fozzie, Ms. Piggy, Rowlf, Statler and Waldorf, and the Swedish Chef legends of their generation. By the time Kermit takes up his banjo and begins singing “Rainbow Connection,” any cold heart should obviously melt to this delightful comedy that Mr. Henson would be surely proud of. I don’t know if the Muppets are “back,” but The Muppets will bring every great memory of their childhood favorites when irreverence and sentimentality collided.